It's hard for Microsoft to improve on the original Visio after stripping out so many features when it bought the product. Microsoft has continued to tighten Visio's focus, and while specialised versions are available for developers, the general purpose Visio is intended for is designing and drawing business charts and diagrams. Visio 2007 simplifies the template and shape libraries by giving them larger previews, and makes it easier to build your drawings on its sample files. The support for themes can give Office documents a similar look and feel, and they also handle colouring/formatting lines, shapes and text. The auto-connect feature makes it easier to hook shapes together cleanly. 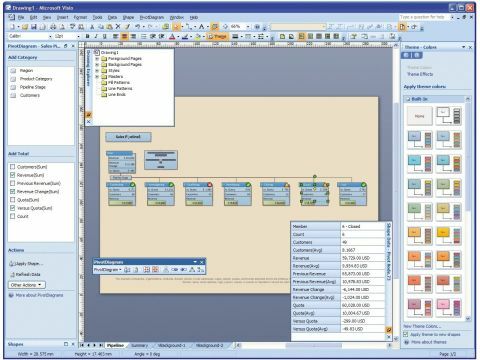 Integrated data helps automatically manage content of diagrams, and builds Visio into workflows and business processes. IT managers will find the built-in ITIL tools useful, along with the IT asset management sample, which links Visio to an Excel worksheet. Visio also helps design and document Active Directories. Visio is useful for the general business user with templates for many common business diagrams that are a whole level beyond SmartArt.